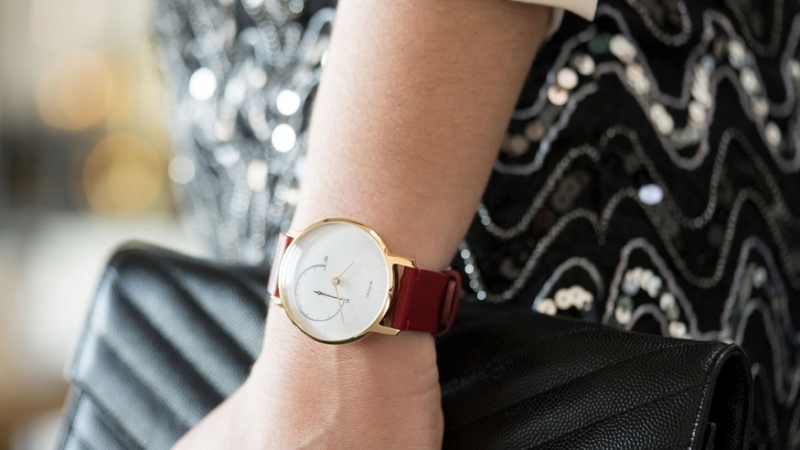 Withings is getting glammed up for the party season by launching the Steel Gold, a more luxurious version of the Activité Steel smart analogue watch and fitness tracker hybrid. Featuring a 24-carat gold coated watch case, the Gold comes with either a dark brown with crocodile print or a red-berry coloured calf leather strap. It offers all of the tracking features included on the Withings Activité Steel, so that means activity and sleep tracking is on board as well as automatic run and swimming tracking. Sadly it misses out some of the more innovative features included in the upcoming Withings Steel HR. It sticks to the dual dial design, with the main dial displaying the time and the secondary one, which has been moved higher up the watch, showing your progress towards hitting those activity tracking goals. You'll still get a vibrating buzz when you hit that target step count as well. As far as watch features are concerned, it automatically adjusts when you step into a new time zone while battery life is up to 8 months thanks to a standard coin cell watch battery. It's water resistant up to 30 metres letting you take it for a dip. All of your fitness tracking data and watch settings are synced to Withings Health Mate, our Fitness and Health Platform of the Year, which has recently added MyFitnessPal integration letting you pull ore detailed food tracking data into the app. If you want a Withings Steel Gold, there will be a limited number available through the Withings website for £209.95. That makes it a little more expensive than the $169.95 it costs to buy the Steel. We don't have any details on whether it's going to be up for grabs in the US, but we'll keep you posted once we know more.